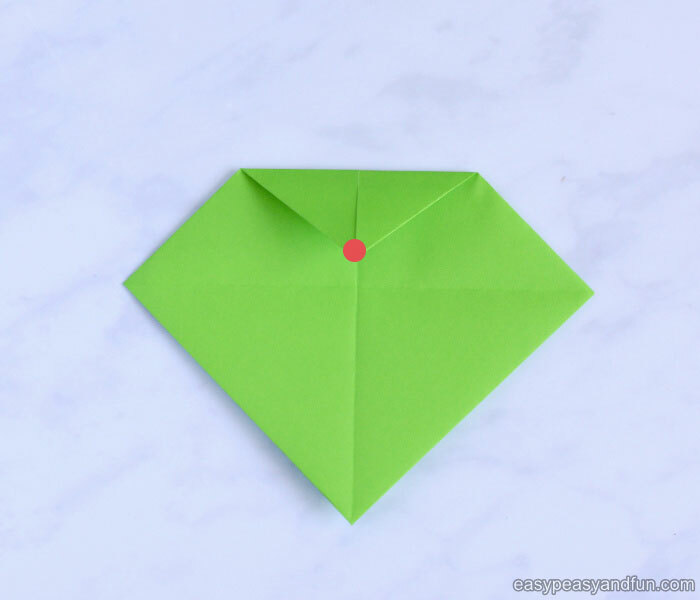 Learn how to make a fortune teller, one of the coolest origami folding projects ever. 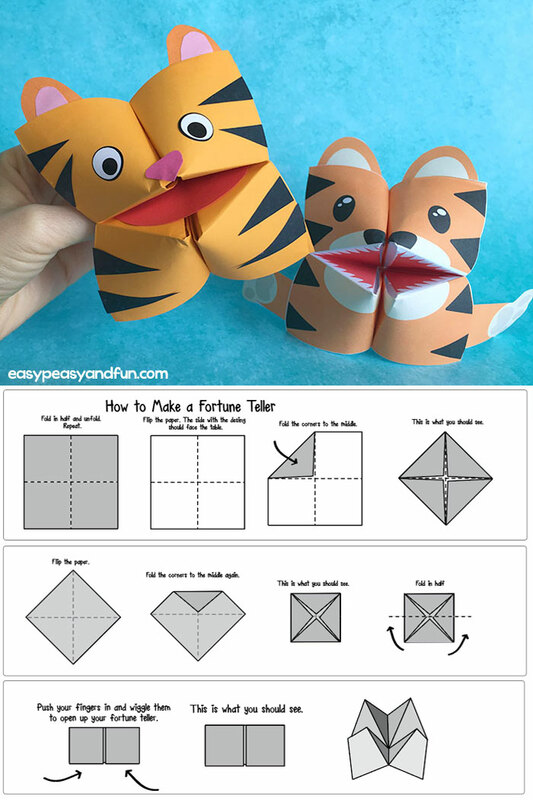 These origami fortune tellers go by many different names, some call them cootie catchers (we love to call them like that), some paper chatterboxes as well as some other names. 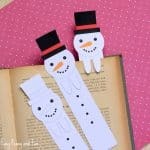 However you may call them, we can agree they are pretty fun – follow the step by step tutorial and make your own. 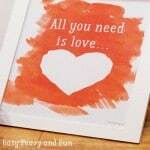 But why stop there? 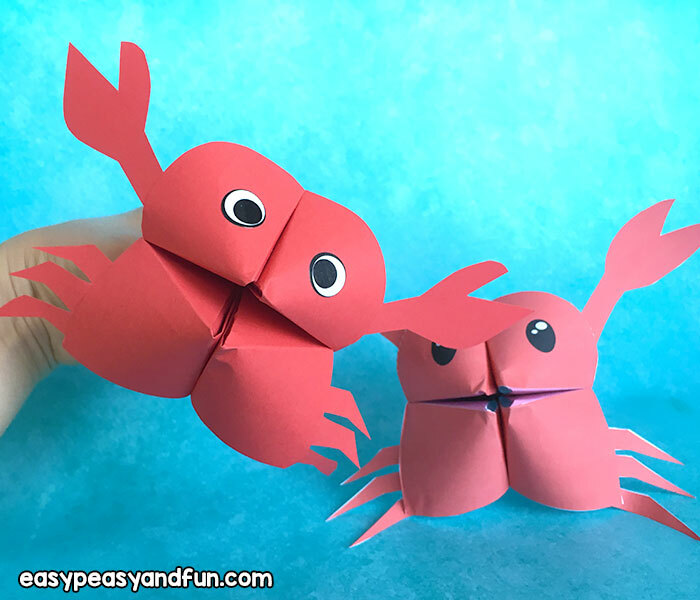 Transform your cootie catcher into a puppet (we have tons of printable templates waiting for you as well as instructions on how to decorate when folding with origami paper. 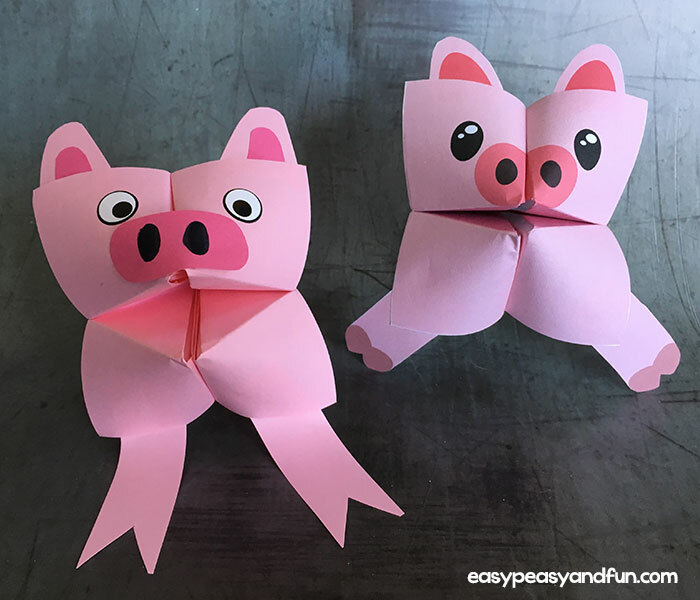 We used to make cootie catchers in school, where they indeed were the fortune tellers, as we would use them to write the names of boys and girls (usually classmates) and then with the help of this DIY paper toy decide our fate. 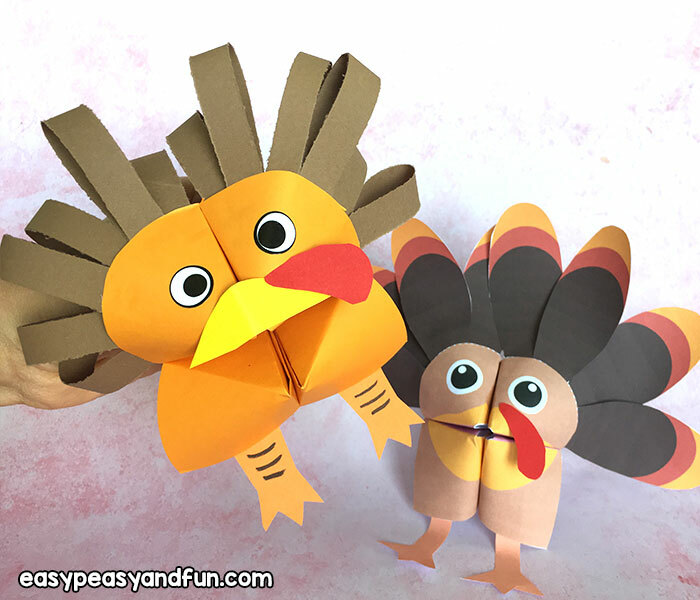 It certainly was fun and even though we do love to share fun cootie catcher animal designs with you, the “basic” fortune telling game still is our favorite. 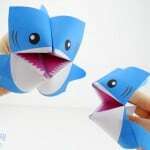 In this tutorial you will learn how to make a fortune teller out of paper (origami paper is best although you can cut a piece of square paper that will serve the same purpuse), as well as show you some ideas how to make them really unique – decorate it to become a shark, a bear, a tiger even – the fun will never end with origami fortune tellers! 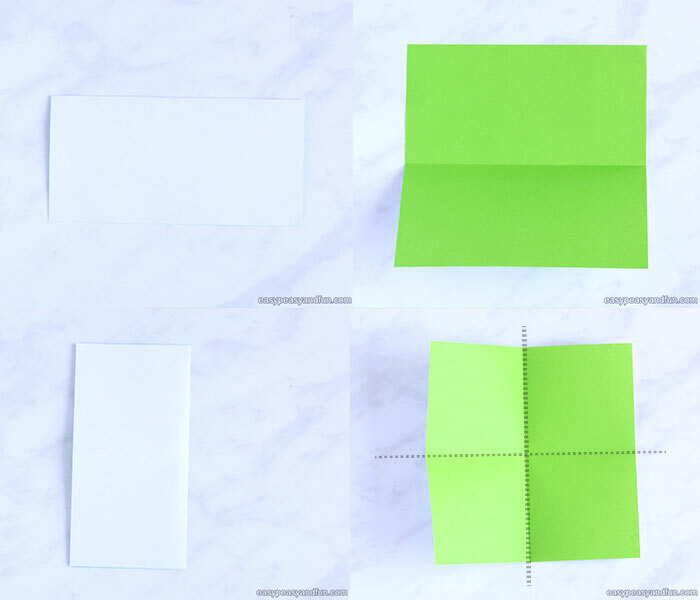 Start with a square paper / sheet of origami paper. 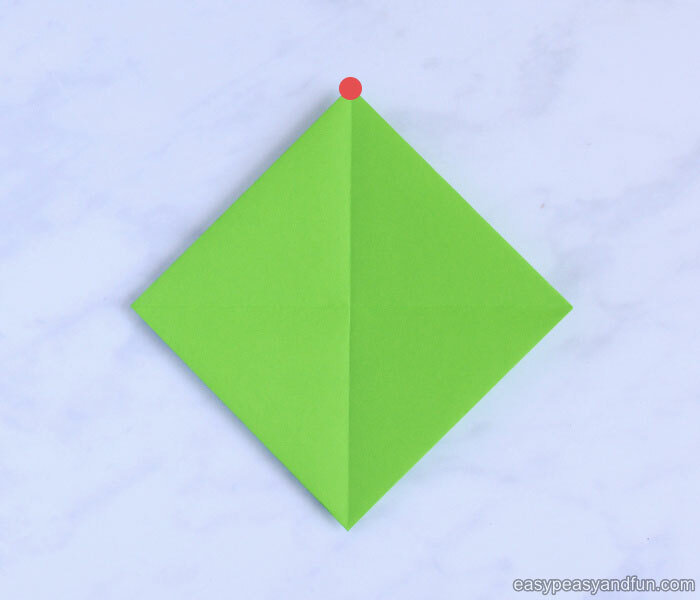 For a regular paper fortune teller you can use regular paper – for cootie catcher puppets you can also use construction paper. It works out nicely. Start folding. First fold the piece of origami paper in half to get a long rectangle. Make the fold crisp. Unfold. 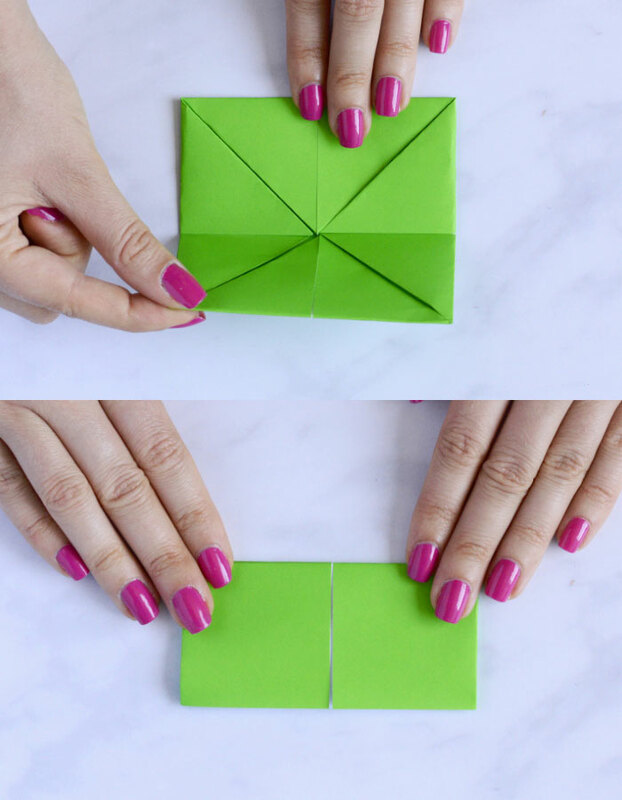 Continue by folding the origami paper in half again, this time along the other side. Make a nice fold. Unfold. 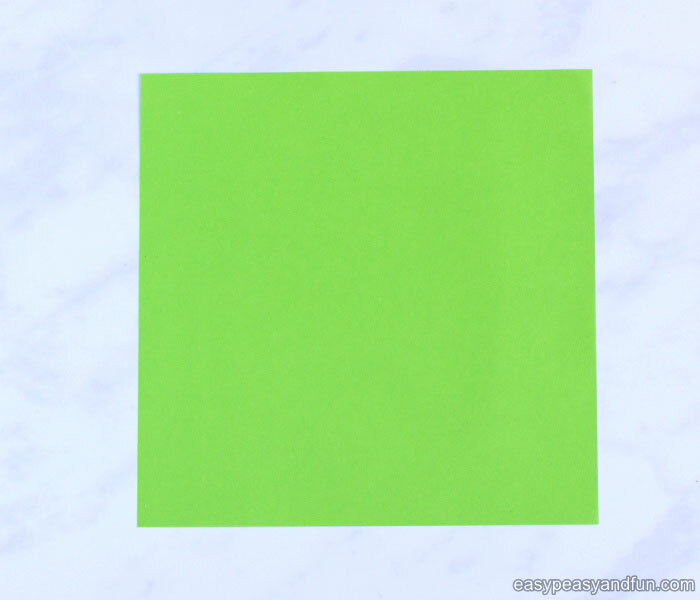 You should see a “cross” across your square paper. 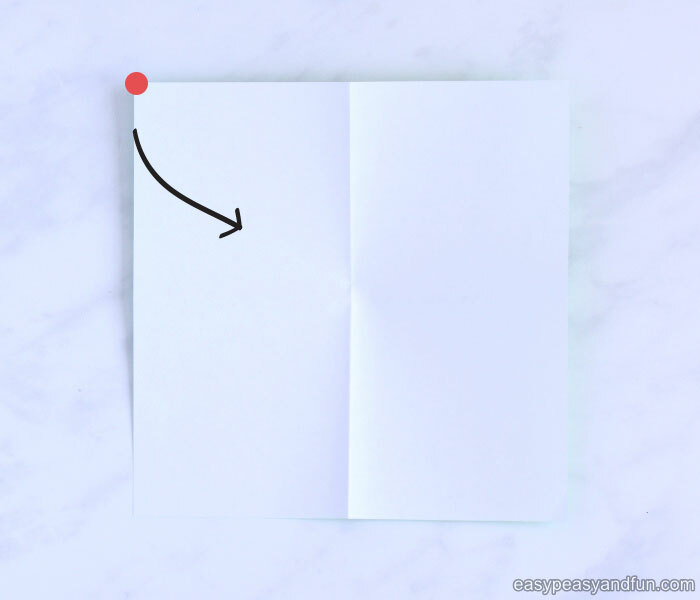 Tip: You can also make diagonal folds – it will make the last step easier. 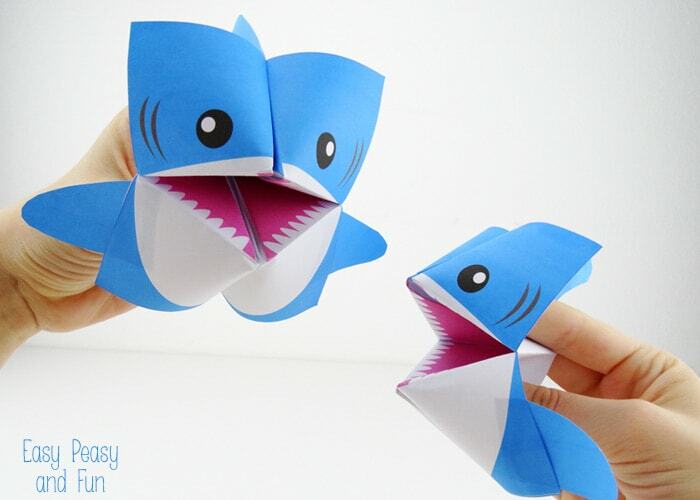 We usually skip this as it makes the cootie catcher puppets look cooler. Flip over the paper, the colored side, or side with the fortune teller design should face the table. 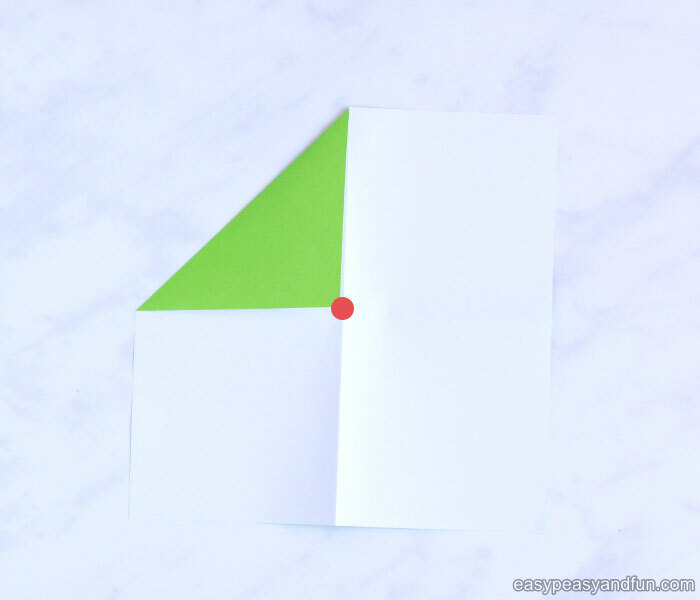 Start folding, bring one of the corners to the center of the paper. Do the same with the other 3 corners. Fold them all towards the middle. Crease well. 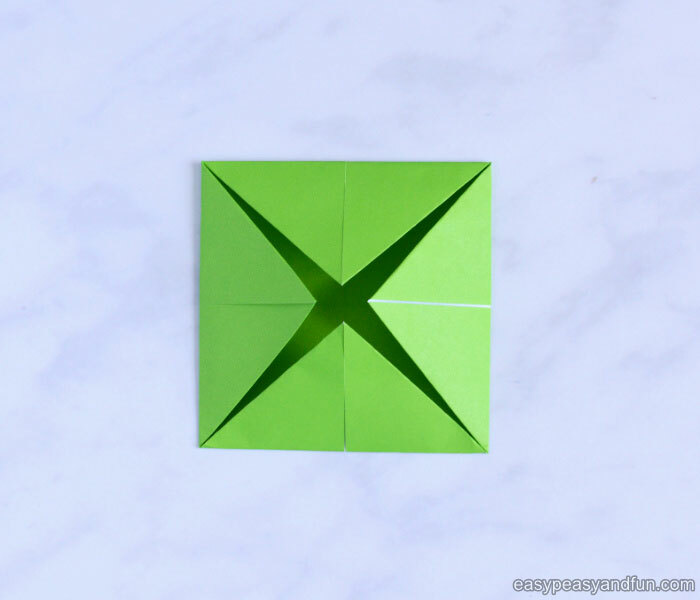 Once you fold all corners towards the center, you will get a square shape again. Again start folding – bring the corners to the middle. Do the same with the other 3 corners. 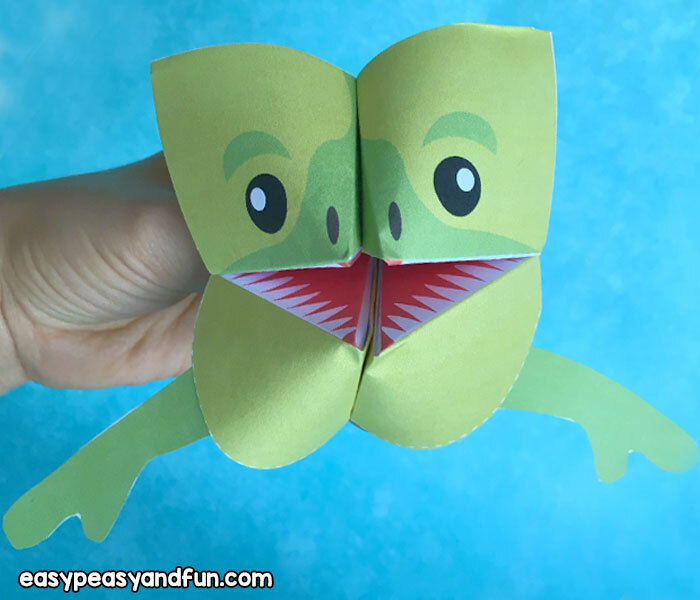 Fold in half. 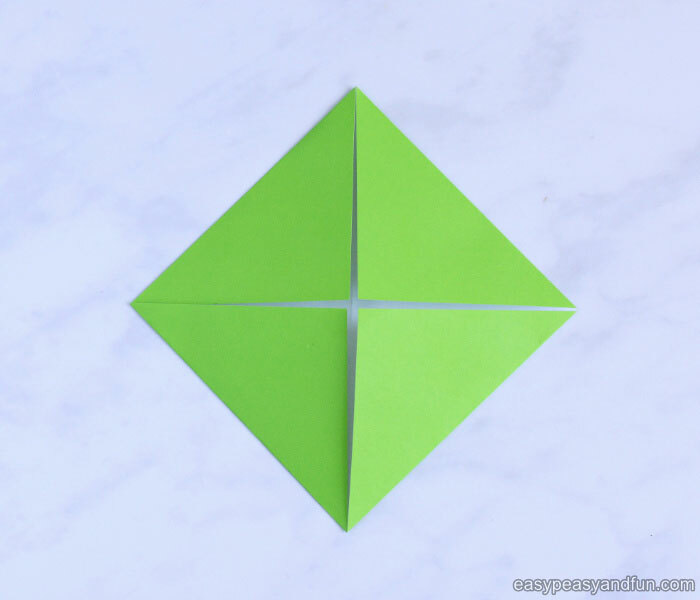 “Close it up” – the “triangles” should be inside and the “squares” should be on the outside once you fold it in half (see photo bellow). One side of the rectangle has “openings”. 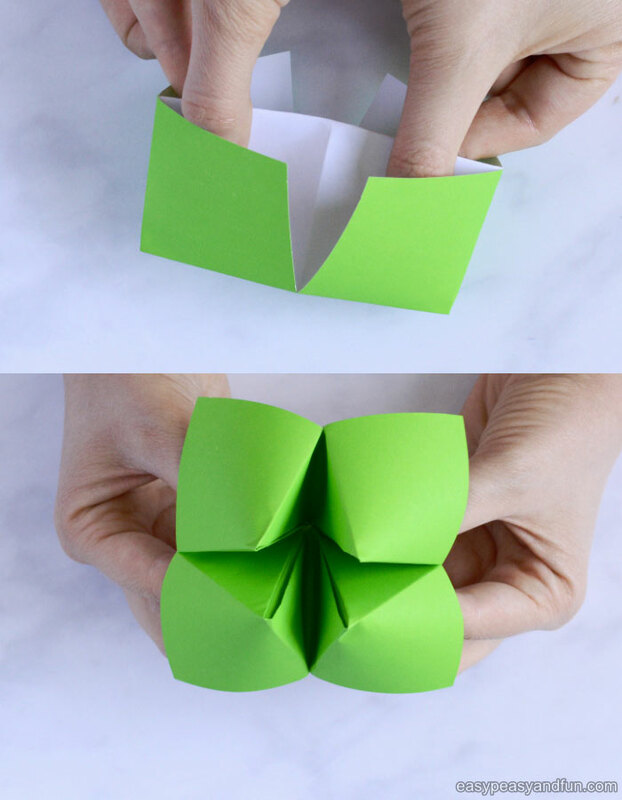 Push your fingers in those openings and wiggle it up a bit, as you continue to wiggle your cootie catcher will begin to form. Congratulations! You have learned how to make a fortune teller! 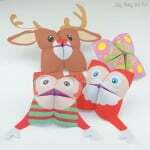 Now lets’ move to the fun part and make some quirky cootie catcher puppets. 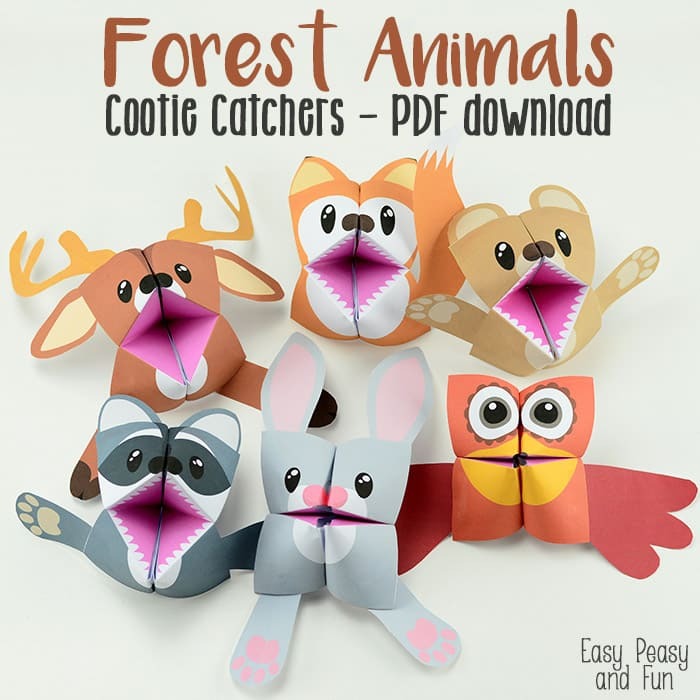 We offer many of these cootie catchers as printable PDF’s so all you need to to is print, cut and fold them. 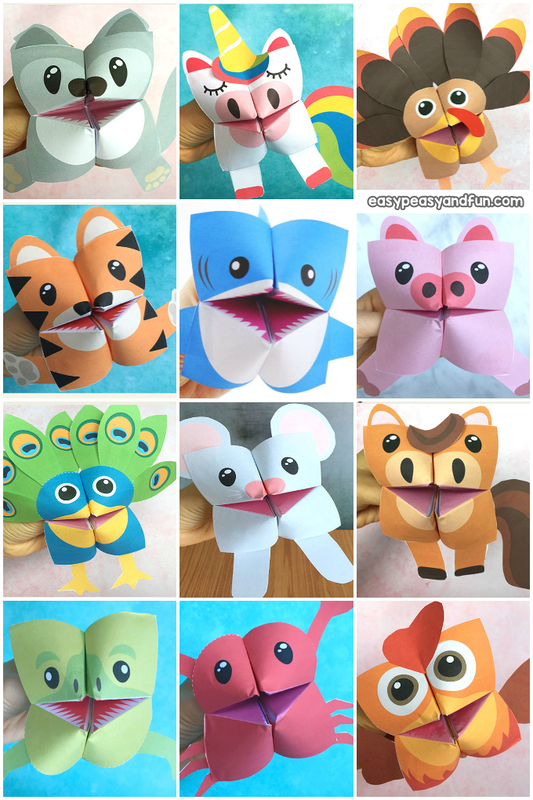 Alternatively you can also use regular origami paper (or print paper cut into a square) and create all kinds of silly creations – tiger, peacock and hedgehog are one of our favorites so do give them a try! Totally rawesome and one of our favorites. A whole bunch of woodland creatures are waiting for you. 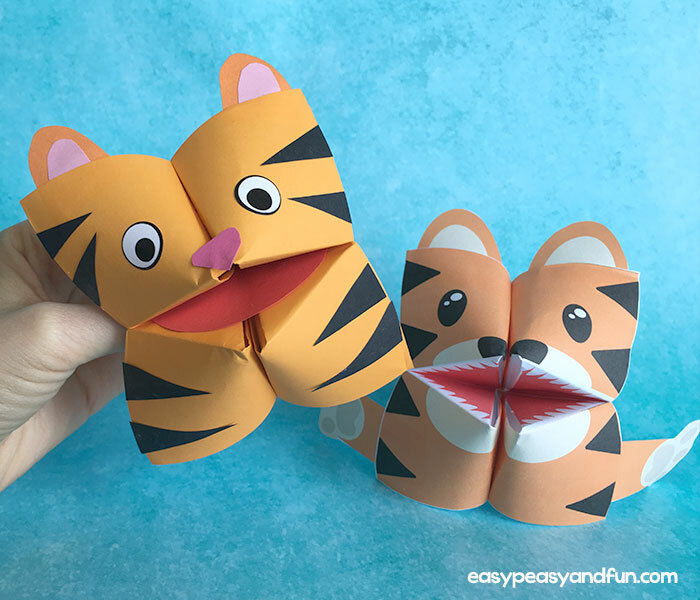 Create one using orange origami paper or use our adorable printable tiger paper toy template (black and white and color version are ready for you). Peacocks are insanely fun because of their wonderful feather tail. 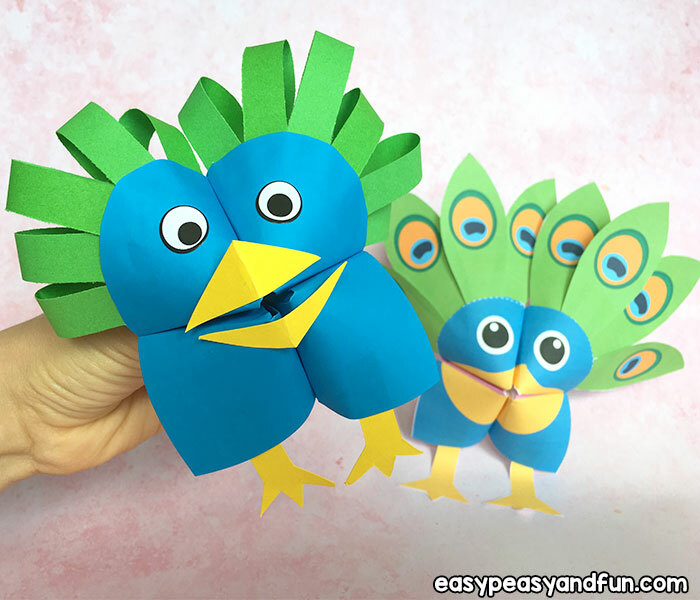 Make one with blue origami paper and paper strips or print our fun design. 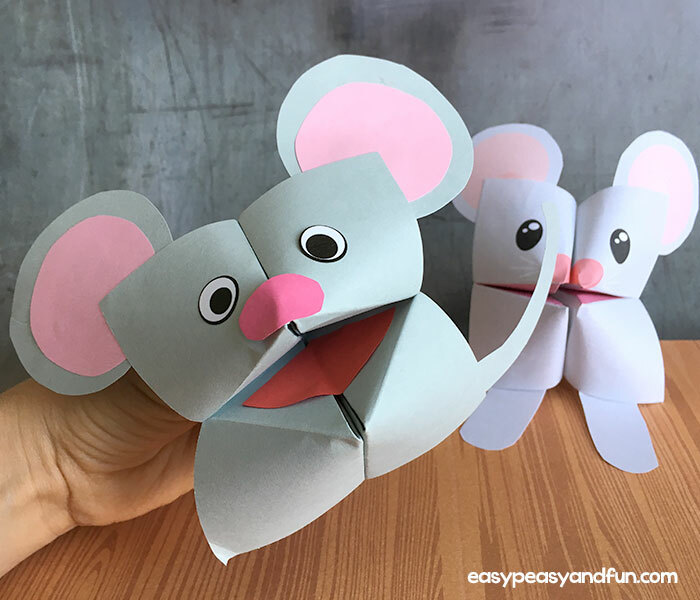 Use gray construction or origami paper to fold a fortune teller, cut two big gray circles and two smaller pink ones for the ears. Add a few details and you’ve got a mouse! Ready for some magic? 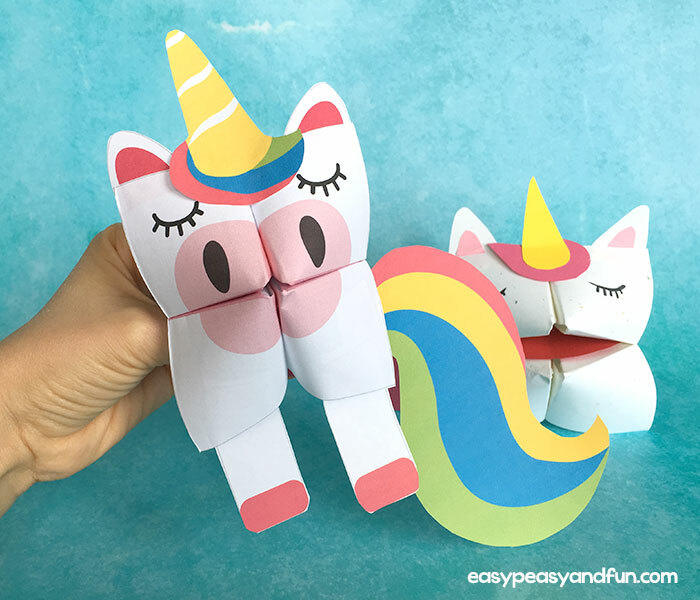 Make an unicorn! Horse has the same level of cuteness as the unicorn does. 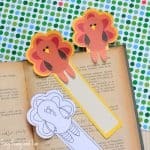 You can most certainly make it out of regular paper too! Oink, oink! 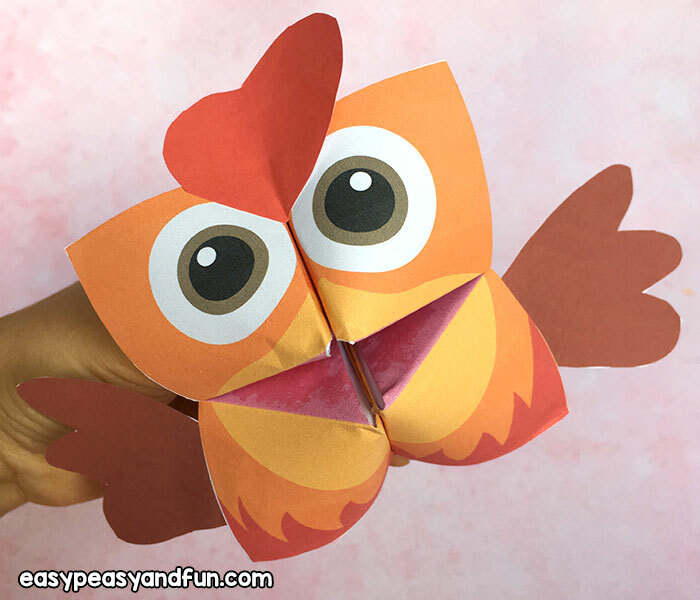 Transform a sheet of pink origami paper into a cute fortune teller puppet!